jmoore, your LTG is coming along beautifully. The yellow grunge sashing sure is making it cheerful looking. Congrats on your long arm. Long Time Gone is a great pattern, just blocks, great for using up scraps. Ohhhh GW, that's exciting too!! What colors/fabrics? Totally scrappy or really organized? Go wild with GW girl!! jmoore...how cheery...yes the yellow Grunge is just right for this lovely! Thanks for sharing your WIP. LTG and MSW beckon me but I think they're on a bucket list right now. No you can't twist my arm from "over there", Anael! I'm starting to think of graduation quilts. #1 GS graduates next year and then it's a down hill roller coaster ride with graduates. We just found out that #14 is on its way this summer. Wow...another little boy so they are ahead with and 8 to 6 ration! I think this will be the last of the grand baby quilts!!!! Have a guild meeting today...better dash as I have some things yet to do before I give the presentation. My GW will be oranges, greens, teals, white. I shopped for all fabric already...it's kitted and ready to go..but it's packed...lol! As you know, I rarely do scrappy quilts. The process frustrates me and makes too big of a mess. I Love other's scrappies but not my own. 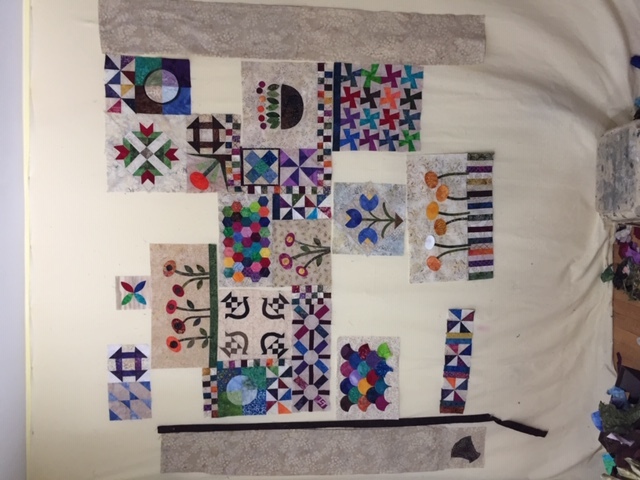 I am almost done with a Dresden quilt I started and I'm using all the remnants and scraps from Happy Birds quilt. The remains will be cut up in the sizes I am collecting for a couple of future projects I'll make when I have enough. Cutting as I go is as scrappy as I am willing to go. Here's what I'm working on today. 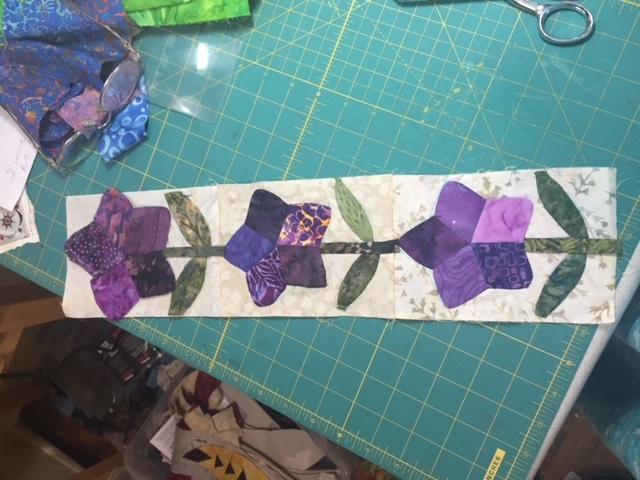 I machine pieced the flowers. And decided to hand applique it, the stems and leaves. Easier that way. 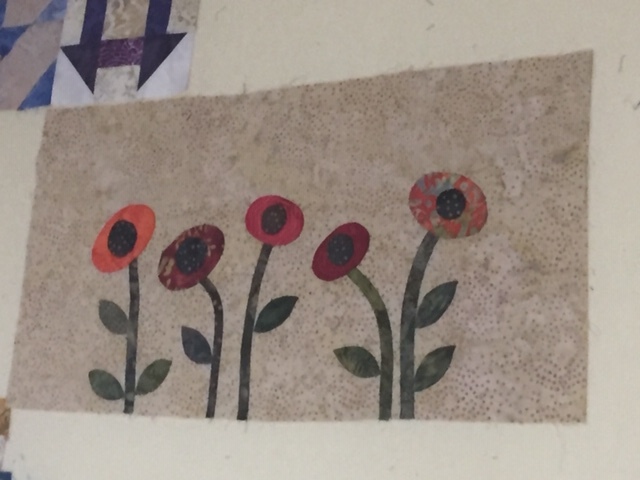 Still have the last flower to sew down. It's a snow day today, good day to sew. All done with this block. I soaked it for a 1/2 hour in cool water last night to get out my washable blue marker, the glue and to puff out the flowers. I made a basket block with 3 little flowers. It spoke to me more than the one that was there. Haven't decided what fabric for the corners. Yes, I ordered Long Time Gone through etsy yesterday. Can't wait to get it. 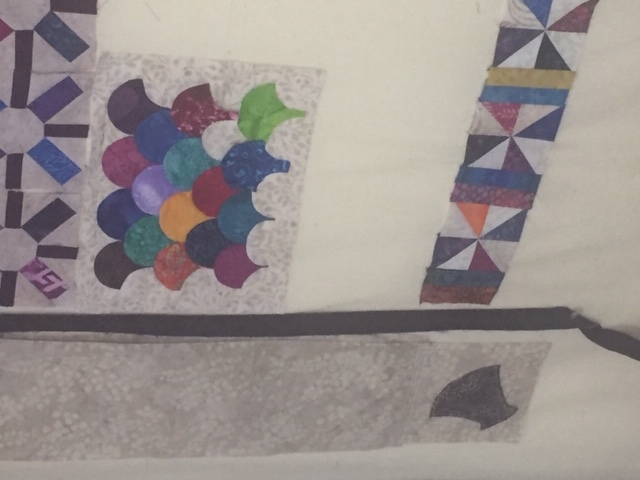 I have a 3 day quilt retreat early in March. That would be a perfect time to start LTG. Hoping to have my GTSB done by then. Love love love your GTSB !!!!! Such lovely colors! The flower basket is great! Oh, I love your basket block with the flowers. It's one of my favorites. Your moving right along on your GTSB's. I need one more clam shell to finish this block. I hand applique d it. Had to watch 3 movies, it took me that long. But wouldn't have wanted it any other way. I've been sewing blocks together this morning. And cut the borders. Still have a few holes to fill in. Don't you love it when it all comes together? Your GBST will be beautiful!! I have 2 weeks to finish it up. Going to a retreat early March and plan to take my big tub of batik scraps and my new pattern for LTG !! On my GTSB I think I'm going to add a thin dark inner border to stop all the bright action of the main quilt. I have a brown hanging in the picture. It's an old strip of binding. I more likely to use a dark blue though. I see what you mean with the thin dark inner border. Will be looking great. On my screen it looks black. Beautiful so far, sewing... I like the look of the mini border. Sewing, Your quilt is going to be beautiful. I love it. I have been finishing up a few things. My Valentines Day quilt is now hanging in my living room. I have put the label on my Mini Wall Hanging for the Wall Hanging Swap. And, I started the next Wall Hanging. I am playing with 1.5" unfinished triangles this time around. 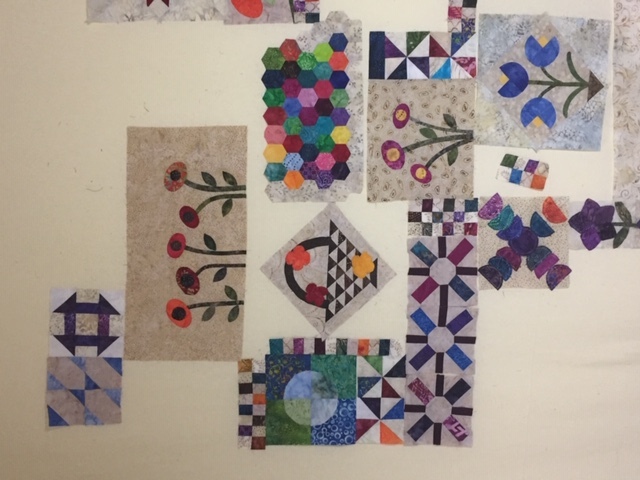 I was inspired by the "color wheel" like quilts that Teen has made. I have the top finished but I have to work on a demo of lettering I want to embroider on it. My next project is making a curtain for my grandsons bedroom. Last edited by Judith1005; 02-18-2019 at 05:36 PM. I'm so glad my work is inspirational to you. Looking forward to seeing what you come up with. I continue to play with color wheel theme. The fabrics I used in the Wonky Neighborhood are being put to use again for another mini...this one is a bit more challenging with color placement and piecing. The smallest size is 7/8"...yikes! I'm almost done and it looks pretty cool. The pattern provided 3 sizes (lap, WH, and mini)....of course, I picked the mini. Lol.. I had enough fabric for a WH size but didn't want one that big so...mini it shall be. I have one more project using this fabric. I'm trying to use what I have out and available since everything is packed...and, I Love rolling around in rainbows so I'm good for now..
Getting down to the last of the blocks on my GTSB quilt. Some of those blocks have taken me 2 days or more to complete. I'm not fast, just persistent.